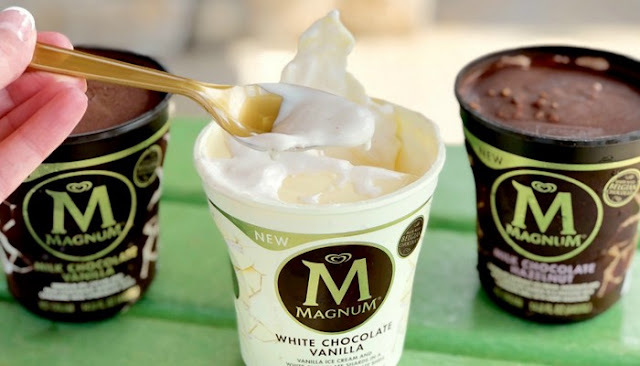 Enjoy Magnum on the spoon. The new Magnum containers are a pleasure to manufacture. But it is worth waiting for a bit of fun. Designed with special care and attention to a unique chocolate experience with every bite. Squeeze the packaging and cut the thick chocolate layer Magnum, which covers the delicious ice cream. There you will find cracks of magnum chocolate fragments in the bath, so that you can have a rich and intense chocolate experience every time. The result is the perfect combination of delicious flavors and textures with every bite. Each bathtub is made with our exclusive Belgian chocolate. Our recipe has an excellent reputation because of the soft and rich taste and the stimulating chocolate taste. It is recognized all over the world for its careful compliance with the craftsmanship of the Old World. Our premium ice cream is handmade in this rich heritage. Although it is still hot, this delicious coating envelops our silky-smooth ice and immediately cools off to prepare our solid, thick bowl for uses and waiting to be cracked. For optimal cracking, soften the Magnum pan for 10 minutes. Pinch the pages of the package together and listen to the signature's slit. Dip the spoon into the richest slice of chocolate that covers the bath and let it go. In addition, the flavors have a great taste, not the chalky taste like other protein brands! This is my favorite drink after a hunt. Walking in the mountains can increase your appetite and muscle fatigue, so I use Magnum to feed both me and the muscles that I worked on that day. It helps my muscles recover faster, so I can get away from here because they hunted us here all year on Hawaii. I have tried a lot of proteins and this is high on the list for the taste! Protein is needed to build muscle and you cannot go wrong with this product. We use these 5 days a week to start the day, all with excellent flavors and very clean proteins. We are very demanding with the kind of protein we use, and after trying this, it is a guard! All flavors taste good and they mix well. I love making new combinations of recipes - recently fresh / frozen peaches, fresh basil, linseed, ice and water mixed with vanilla - very light and summery. As an ambassador of Mountain Ops I believe in your products. I have been using Magnum for more than 6 months and I can say that this is the whey protein for me. I love the new lemon poppy and notice that all the flavors I have tasted are soft and non-granular and I mix with pure water. From time to time I add ice to let a light drink last longer. I am in the morning. The best protein on the market - without a doubt! I take Mnt-Ops Magnum 2 to 3 times a day in the shh... after a workout, a snack or a snack. It mixes easily, has a great taste and gives great results. So far I like all the flavors I've tried, but I'm probably more inclined to chocolate and vanilla. Strawberries and cream are my favorite taste, although I have not tried the chocolate. I use this in my routine after I leave my gym. I have found a significant improvement in muscle recovery time and faster muscle recovery. Great Post Workout Shake! I have been taking the MTNOPS Magnum for two years. The taste is great. I used vanilla, strawberry and chocolate. This mix very well with water, milk (almonds and rice) with a spoon, a shaker and of course a blender. Without aftertaste and, more importantly, this is the only protein that does not cause an upset stomach. Magnum is the best protein I have ever tasted. I stopped buying because all the other products I tried were awful in taste or aftertaste or my digestion made a disaster. Magnum is a favorite of the family. My children ask me to always make protein shakes or muffins.